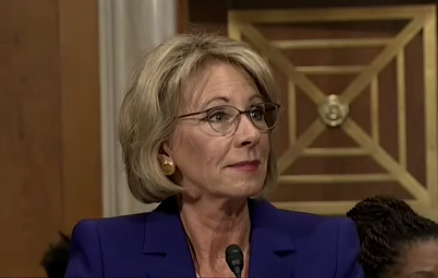 “It was painful to watch,” says Atkinson of this month’s DeVos hearings. And while the state’s $800 million or so in annual K-12 cash from the federal government accounts for less than 10 percent of North Carolina’s total K-12 budget—meaning, at the very least, the federal education secretary’s control over state schools’ purse strings is somewhat limited—leaders like Atkinson point out North Carolina leans heavily upon federal cash to fund outreach and assistance in some of the state’s poorest schools. “There is the potential for much influence in North Carolina,” warns Atkinson. To public education advocates, DeVos’ nomination, which is likely to be wrapped by the Republican-controlled U.S. Senate by month’s end, is the latest blow to a system under assault by privatization, difficult financial straits, and the growing school choice movement. Weingarten points to DeVos’ integral role in piloting a charter school boom in her home state of Michigan, where critics say the movement has spurred destabilization of public schools and an influx of flagging charters in Detroit. Mark Jewell, president of the N.C. Association of Educators, the state’s most powerful teacher lobbying organization, also slammed DeVos’ nomination this week. In particular, Jewell said he was most worried with a strange confirmation hearing in which the nominee, at times, seemed confused or unwilling to answer questions about education policy. 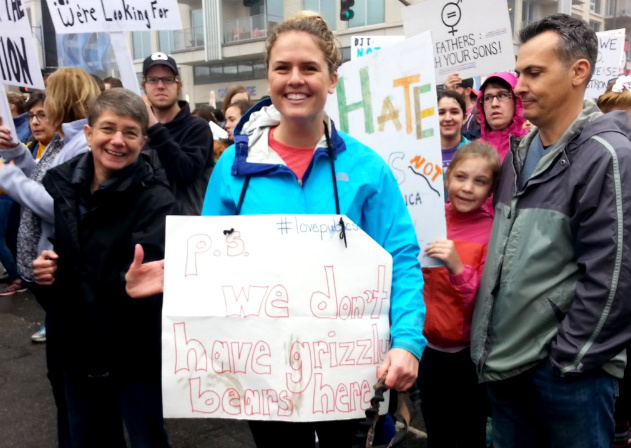 DeVos’ comments about grizzly bears, guns and public schools inspired this sign at the Women’s March In Raleigh last Saturday. At one point, DeVos even defended the notion of students packing guns to school, pointing out some schools in Wyoming may require protection from grizzly bears. “It was alarming to see her lack of knowledge and depth on public education policy issues,” says Jewell, adding that many education experts and advocates like him believe DeVos to be unqualified for the role. Many Republican leaders nationwide clearly disagree. Last week, public officials from all 50 states, including GOP chiefs in North Carolina such as Lt. Gov. Dan Forest and Senate President Phil Berger, signed off on a letter backing DeVos’ confirmation. Thus, among the most pressing questions for public school supporters as DeVos’ confirmation looms: How can a nominee with virtually no experience leading public schools govern the nation’s complicated, vast network of public schools? How, precisely, can the nation afford one of President Trump’s lone K-12 campaign promises to roll out a $20 billion private school voucher program? And how much power will DeVos—a wealthy education activist in Michigan—wield over schools in this state should the Senate confirm Trump’s controversial pick? Answering the first two questions, public school experts agree, is virtually impossible given the administration’s reluctance to discuss specifics, but in reference to the latter question: More than you might think, some say, but in perhaps less splashy ways than DeVos’ worst critics fear. Perhaps DeVos’ greatest power as education secretary, experts say, would come during the ongoing rollout of the Every Student Succeeds Act (ESSA), the so-called “Christmas miracle” of 2015, in which Republicans and Democrats on Capitol Hill found common ground in reforming No Child Left Behind, the nation’s much-reviled federal education law. Critics said the former law, authored during a burgeoning school accountability movement in the early 2000s, helped to usher in an era of “over-testing” and punitive enforcement that forced teachers out of the profession and seemed to hamper already struggling schools. ESSA, backers say, will give states greater power in crafting their own school accountability measures, a reform applauded by both Democrats and the GOP in North Carolina. With ESSA fully in place by the start of the 2017-2018 school year, Trump’s administration will have the power to approve or deny state-authored accountability plans for schools this year. Furthermore, DeVos and Trump could push a contingency of ESSA allowing for students in chronically struggling public schools to transfer to another. At the least, experts say they believe DeVos and the Trump administration, coupled with a Republican-dominated Congress, will be bullish in backing a greater federal role in charter and private school expansion, as well as vouchers that dispense public funds for children to attend private schools. Private school vouchers are one of the most polarizing debates in the nation’s schools today. Supporters say they offer a means for low-income children to escape chronically underperforming schools. Opponents say they divert public dollars to unaccountable schools that, in North Carolina at least, oftentimes offer religious-based instruction without a regulated curriculum and qualifications for staff. DeVos’ plan for ESSA implementation, however, is short on specifics, officials say. Atkinson, a Democrat who lauded efforts to give states’ greater latitude over oft-criticized federal accountability measures, says DeVos would have little role in North Carolina if she follows through on her hearing promises to leave most of the policymaking to states. But Jewell says ESSA’s implementation, regardless of her hearing statements, could allow DeVos to have a “huge impact” in North Carolina. Houck says the “lack of specificity” from the Trump administration makes this a difficult question to answer. “It is very hard to see what is going to catch this administration’s attention,” says Houck. Numerous questions remain as well about the size of the department that DeVos would oversee. Today, it’s a $70 billion agency, but on the campaign trail, Trump declared his intention to hand down major cuts to a federal public education system that plays a pivotal role in bankrolling aid for low-income students in the states. Considering the majority of the nation’s public school students are in poverty, Weingarten says the importance of the federal education department to the neediest students cannot be overstated. Meanwhile, school choice advocates like DeVos often contend the nation’s public schools have failed such children, and that private competition for public institutions should only strengthen public efforts. But Weingarten says it’s an ideology that will ultimately fail the nation’s poor children. Yet in Trump’s support for private schools and charters, DeVos, despite her lack of experience in public education, seems a fitting choice for the new president. DeVos and her family, in addition to her school choice advocacy in Michigan, have donated large sums to candidates pushing for school choice at both the federal and state level. In North Carolina, campaign finance records show, her family has given thousands to former Gov. Pat McCrory, as well as former state representatives like Democrat Marcus Brandon (now a charter backer with the group Carolina CAN) and Bryan Holloway, a former Republican lawmaker who stepped down from his state seat to become an education lobbyist in 2015. DeVos’ family also contributed to Republican Bill Cobey, a former U.S. congressman representing North Carolina who once ran for governor and now chairs the State Board of Education. Cobey says he’s had limited interaction with DeVos, but calls himself “an admirer of hers,” suggesting the nominee’s critics are underestimating her willingness to support public schools. “She’s very bright and able, and a person who wants the best for all children,” Cobey said. Regardless, Cobey says DeVos will not have the power, as her most ardent critics fear, to hand down seismic shifts to the nation’s public schools. Houck, an expert in national and state education policy, agrees, pointing out any education secretary, no matter how bold or sweeping their proposals, must still work through the “checks and balances” of Congress as well as state and local government. But, regardless of the nominee’s potential power, critics like Weingarten say the DeVos family’s widespread financial interest in school privatization and other for-profit companies should be a major concern. The nominee has reportedly acknowledged possible financial conflicts that may rival Trump himself, including a multi-million dollar stake in a Michigan biofeedback company that specializes in treating children for attention deficit disorder and autism. “She appears to be fixated on making money off of kids, first and foremost,” says Weingarten. And for many of DeVos’ toughest critics, her lack of experience in public education, as well as a widely lambasted performance during Senate confirmation, should give leaders pause. “She sees education through a very narrow lens, and that’s through charters and vouchers,” he says. Houck says DeVos would be best served by broadening her understanding of the nation’s schools and its complicated bureaucracy, taking into account that the vast majority, about 90 percent, of the nation’s students are enrolled in public schools. Cobey, meanwhile, says he’s not concerned with DeVos’ resume or her performance in confirmation hearings. And, Cobey argues, DeVos’ critics may be surprised by her performance. But public school advocates say DeVos will have much to prove on that front. “People want kids to have a great education,” says Weingarten. “And they know the only place that is accountable and responsible to do that is in the public schools.